Following the Income-Tax raids at his residence in Chennai, the Enforcement Directorate (ED) on Friday slapped a money laundering case against P. Chidamabaram's son Karti and others, taking cognizance of the Central Bureau of Investigation (CBI) FIR against him. 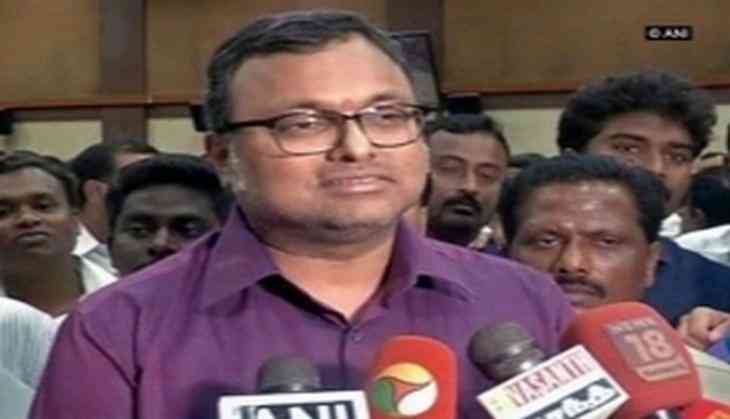 Karti, whose residence was raided by the Central Bureau of Investigation (CBI) in connection with the grant of FIPB approval to INX media private Ltd, said here on Wednesday that the 'drama' was finally over. This came after his asserting that all charges against him are completely bogus and he will stand vindicated one day. "Whatever I heard is only from the media. Nothing of substance. All charges on me are completely bogus and I will stand vindicated one day," Karti told the media. However, CBI Joint Director Vineet Vinayak said the investigation is still underway and some important evidences such as hard disks, mails and documents have been recovered. Vinayak said a criminal case was registered yesterday under various sections of conspiracy, illegal gratification to influence a public servant, cheating and misuse of official position against five main individuals and entities, unnamed officials of Foreign Investment Promotion Board (FIPB) and others in the matters related in the grant of FIPB approval to INX media private Ltd, represented by its then directors Indrani Mukerjea and Pritam Mukerjea alias Peter Mukerjea. An FIR has been lodged against Karti, Indrani Mukerjea, unknown officers of FIPB Unit of Ministry of Finance and others over alleged financial misappropriation over Foreign Investment Promotion Board (FIPB) clearance to Peter and Indrani's media company INX Media in 2008. The charges include criminal conspiracy, cheating, taking gratification in order by corrupt or illegal means to influence public servant and criminal misconduct. The case has been registered under section 120-B r/w, section 420, section 8 and section 13(2) r/w and 13 (1) (d) of Indian Penal Code (IPC).